Didymo or "rock snot" has been found to be non-invasive. This discovery debunks the assumption that didymo was introduced to rivers by humans and suggests that didymo blooms may be linked to global climate change. Credit: Michel Chouinard. An algal species known commonly as didymo or "rock snot" has been found to be non-invasive after a collaboration between researchers from Queen's, l'Institut national de la recherché scientifique (INRS), and Brock University. The discovery debunks assumptions that didymo – a nuisance algae that may threaten juvenile salmon because of habitat overlap – was introduced to different rivers in eastern Canada by humans. Now, it seems that didymo blooms may be linked to the effects of global climate change on aquatic ecosystems. "Didymo has been present in the regional algal community for much longer than many people thought. Instead of human introduction, an environmental trigger is a more probable cause for its recent proliferation," says Michelle Lavery, the study's lead author who began this research at Queen's as an undergraduate thesis student and is now completing her Masters at the Canadian Rivers Institute at the University of New Brunswick. Didymo was first officially reported in the Gaspésie region of eastern Canada in 2006 and has now been observed in more than 25 river ecosystems. 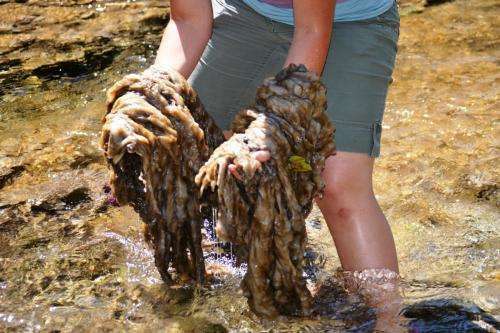 The algae grows in thick, woolly mats on the bottom of riverbeds and can have negative effects on the river flora and fauna. The study suggests that climate warming accelerated in the region starting in the 1970s may have created favourable conditions for the growth and spread of didymo. "This is yet another example of the harmful effects of climate change," says John Smol, study researcher, biology professor at Queens's and Canada Research Chair in Environmental Change. "Too much of any algae can be a problem. For areas in Quebec and New Brunswick that are world-renowned for recreational Atlantic salmon angling, didymo blooms may lead to undesirable ecosystem effects." This study was published in the Canadian Journal of Fisheries and Aquatic Sciences and was funded by the Atlantic Salmon Conservation Foundation and the Natural Sciences and Engineering Research Council of Canada. Climate change invites alien invaders -- Is Canada ready?